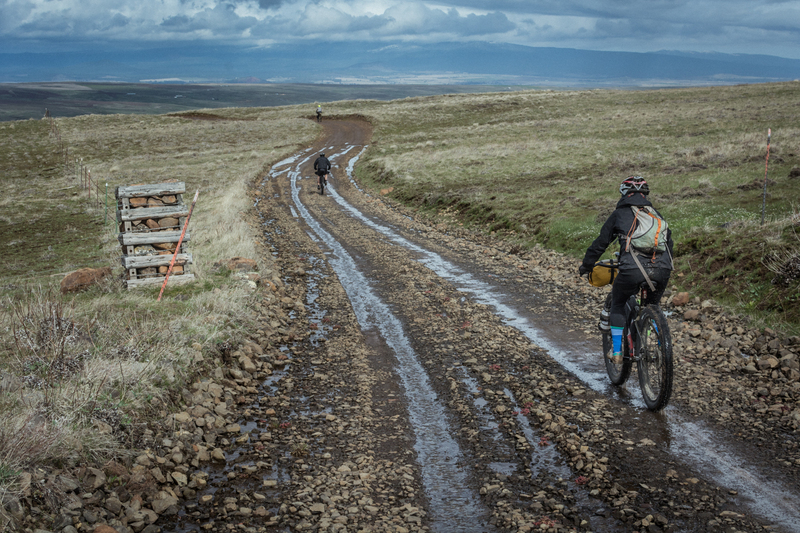 Looking back towards The Dalles where we started. 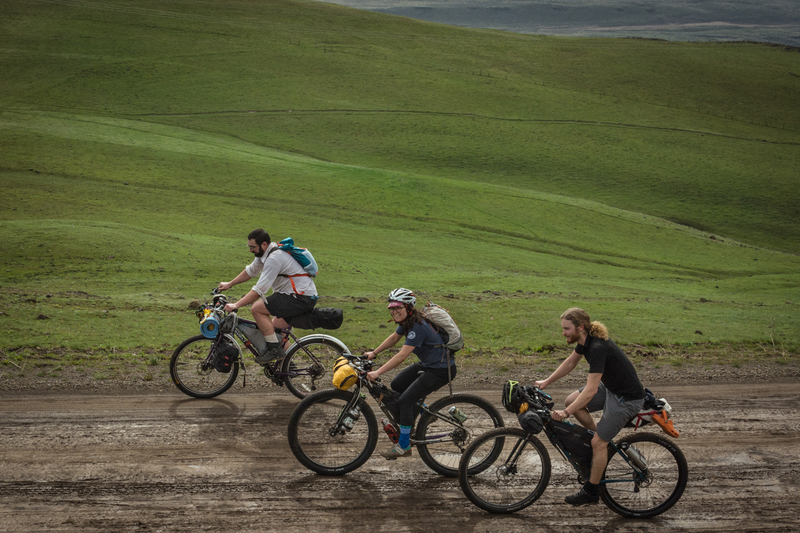 Welcome to The Ride, our ongoing series of inspirational adventure stories sponsored by 21st Avenue Bicycles. See more from this series here. 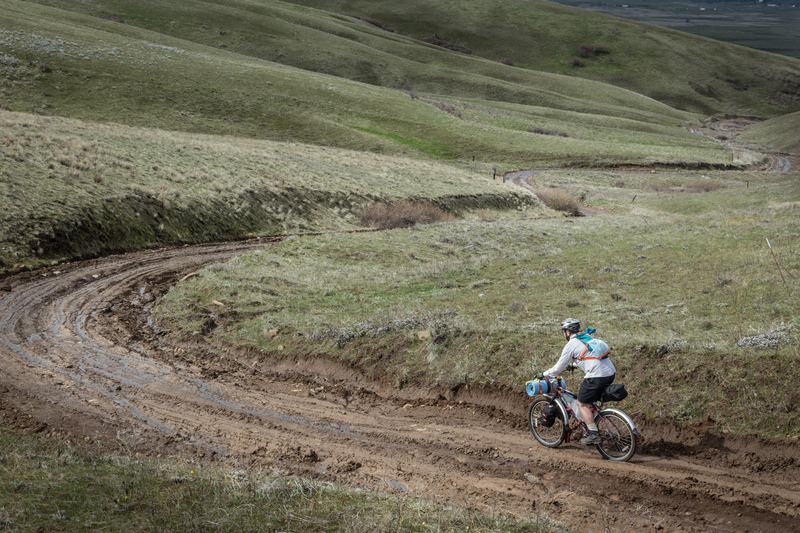 It’s becoming that time of year again when cyclists start coming out of hibernation and you can usually count on it being sunny (or at least not snowy) in the rolling grass hills of the eastern Columbia River Gorge. 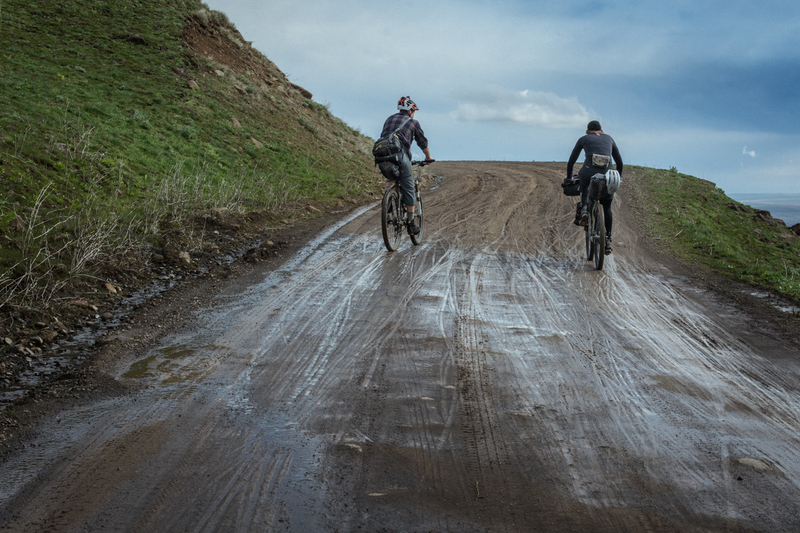 One of VeloDirt’s longest running rides — the Dalles Mountain 60 — took place last weekend starting anarchically from the unassuming parking lot of Holsteins Coffee in The Dalles. For a non-event, just a murmur between friends on Instagram or the simple expectation of tradition every second Saturday of March, it’s a rather popular ride. By 2014 I had already ridden the route several times so convinced a few friends to mutiny the usual day ride and peel off to go camping in the woods in search of a possibly fictitious “Rattlesnake Falls.” Now, as I rolled into the parking lot this past Saturday I still hadn’t found Rattlesnake Falls but was looking forward to our third anniversary of a soggy, wet, and beautiful bike camping trip along the Klickitat River. 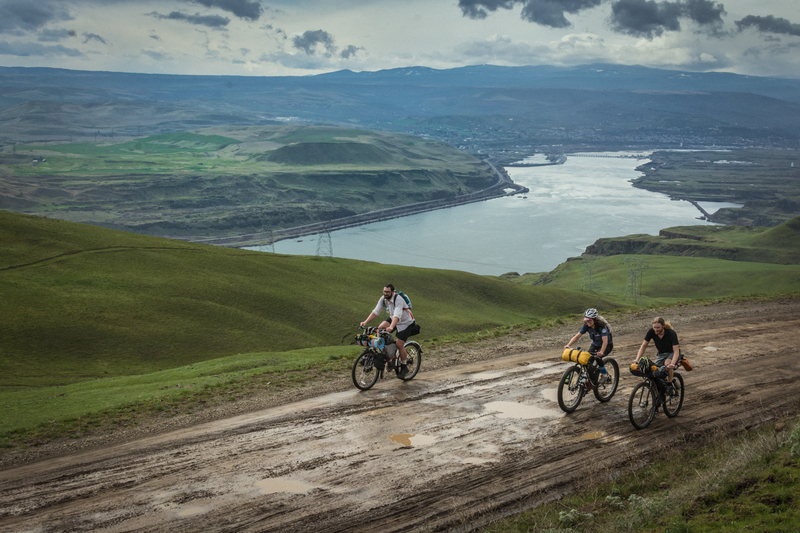 The unladen and non-mutinous riders quickly outpaced us as we rolled out of town and across the river. 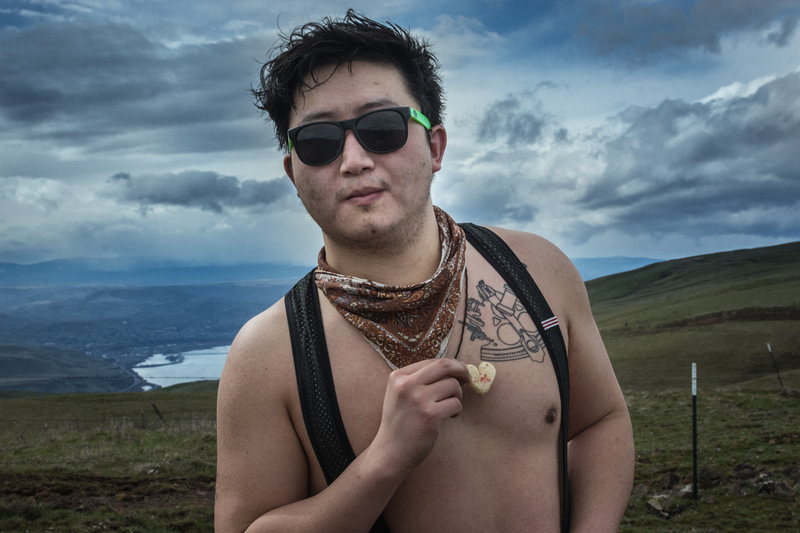 Our jovial few loaded down with tents, dehydrated meals, and flasks of bourbon congealed together into a group with warm laughs and bad jokes as we began the long climb. 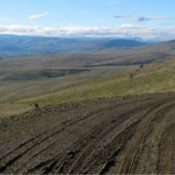 Dalles Mountain was in prime spring form from the generous winter rains and as a result spectacularly covered in a verdant green pelt speckled with yellows and purples in the mottled sunlight. 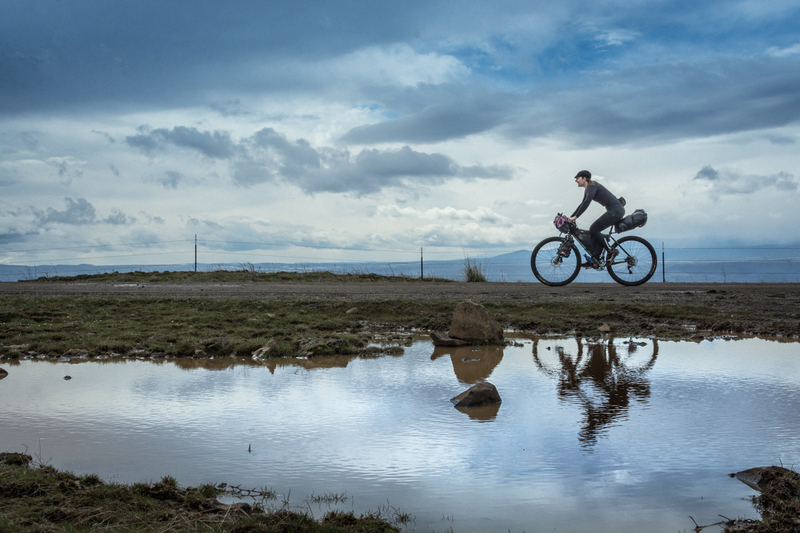 Jocelyn Gaudi of the Komorebi Cycling Team rolling by a reflecting pool at the summit of the first climb. “Nothing but heart,” he said. 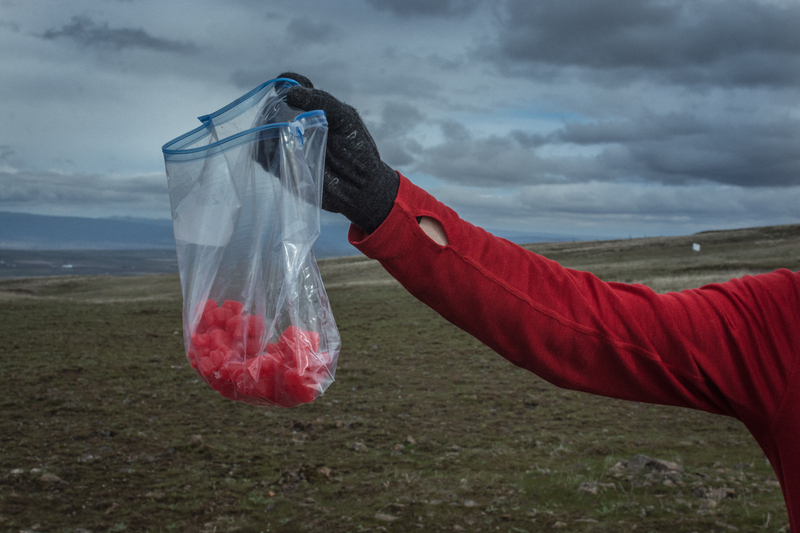 Anyone for a gummi bear? 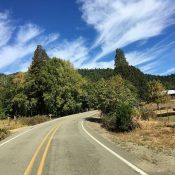 Passing by O’Brien Creek Road. Ribbon road through the Prarie Hills. 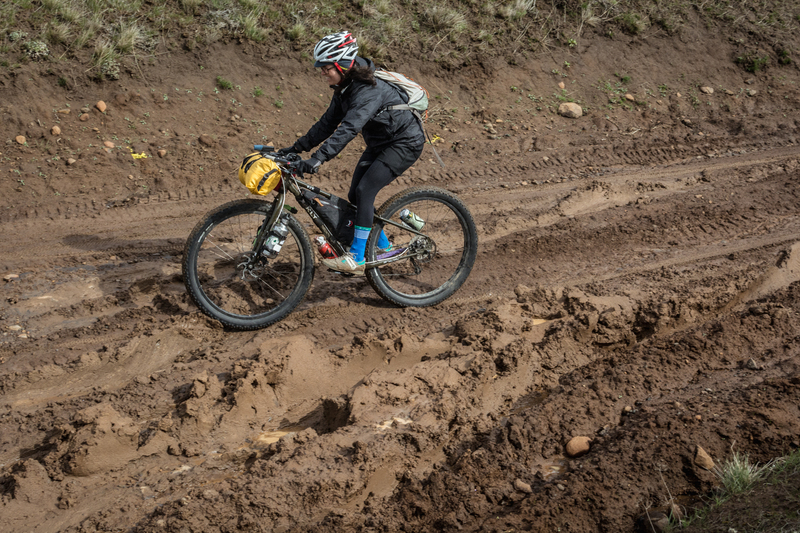 Staying out of the ruts. 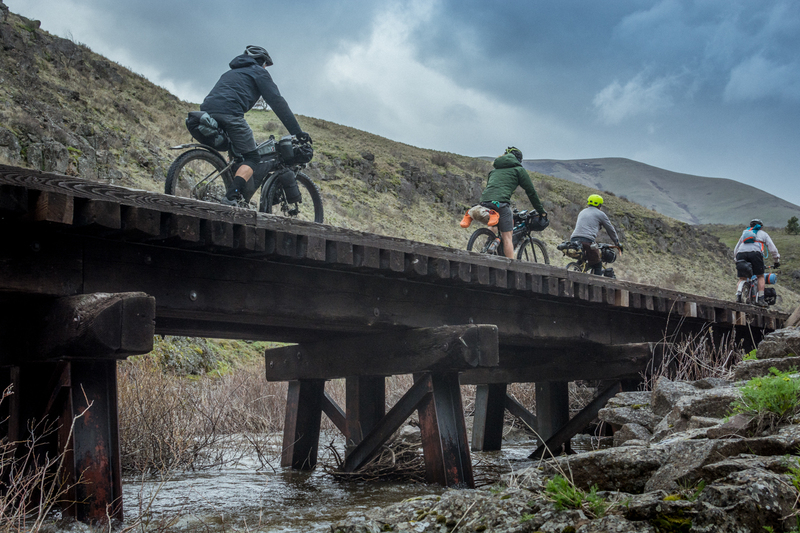 An old railroad trestle over Swale Creek. Bushwacking in search of a place to camp. 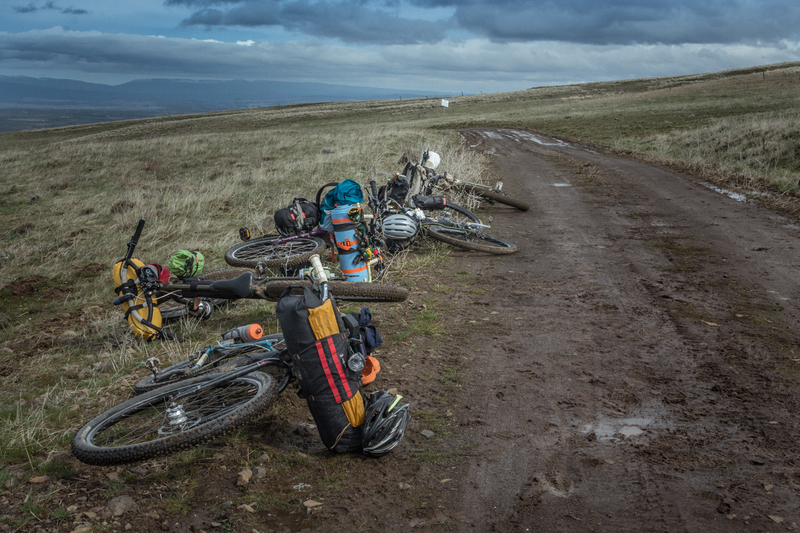 As we neared the summit and split off from the main group the skies clouded over, a cold wind picked up, and a few shards of unfriendly rain began to fall. It was time to get to camp. 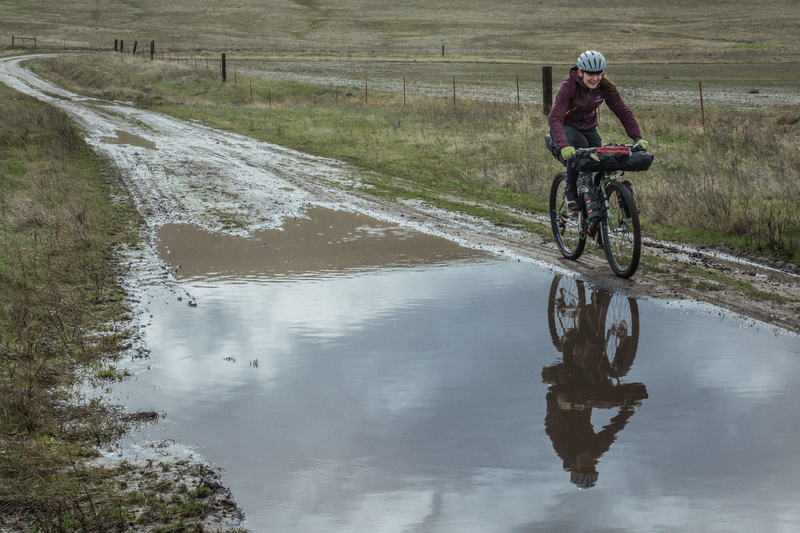 We descended O’Brien Road (“IMPASSABLE WHEN WET”) in a skittering, splashing, gleeful fashion, excited to be losing elevation and entered the upper reaches of Swale Canyon. 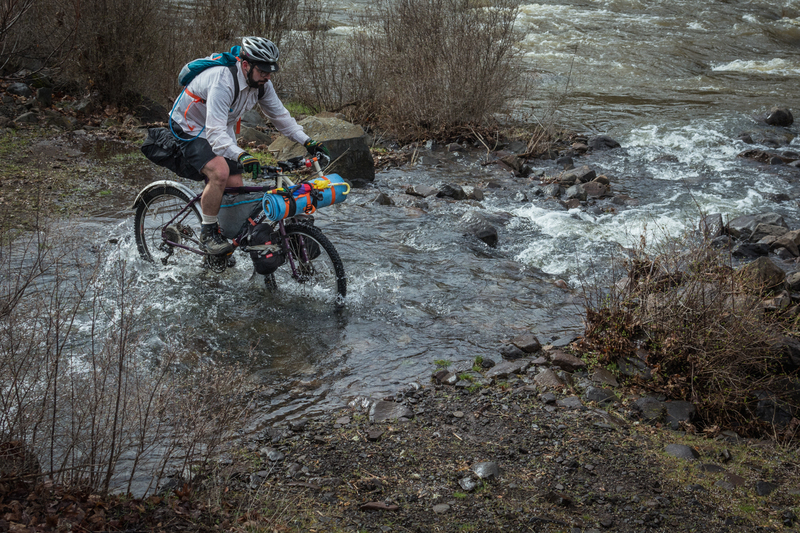 Swale Creek is a tributary of the Klickitat River and hosts a little-used rail trail that would eventually bring us in a large arc back to the Gorge, within striking distance of The Dalles. Somewhere in between lay a few flat patches of river bank and hopefully some dry wood. 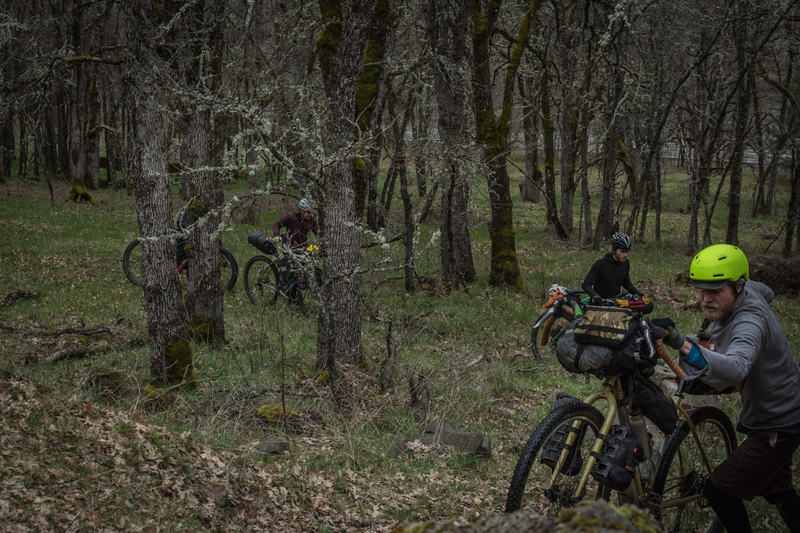 Sure enough, after countless rail trestles, an abandoned sawmill, a stop at the hot case in Klickitat, and one unfortunate flat tire we pitched tents and managed to spark a fire with some crystallized Red Pine pitch. We shared wine, camping recipes, and stories of previous years’ failed attempts to find the waterfalls. And in the morning we packed up soggy gear, dawdled in camp until noon, and poked our way back home taking every chance to stop and look at passing trains or chat with curious locals. Spring had arrived and was infectious as always. 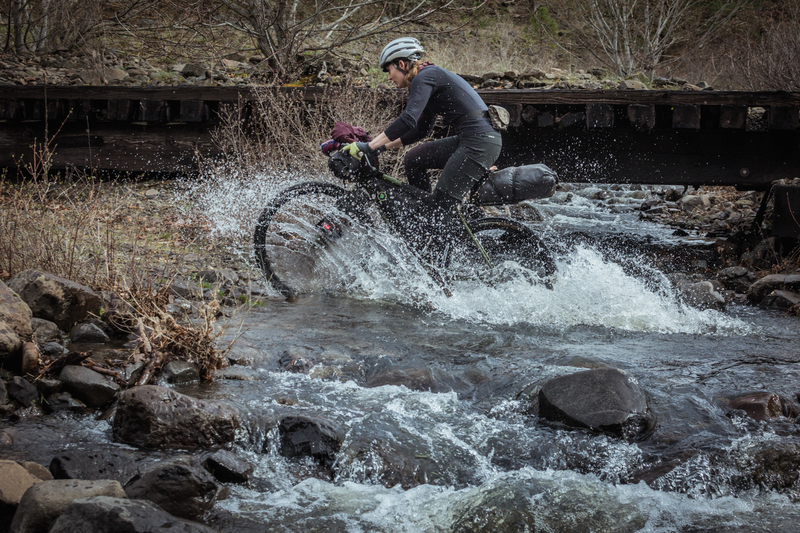 Learn more and ride the route yourself with Limberlost’s Ambassador Route on Ride With GPS. Nicely written story. Stunning vistas out over the river. Such wide, open landscapes. Considering that here in the Tualitan and Willamette valleys, great vista seem to be given away bit by bit to development, it’s great that areas of the state still have them. Questions: anyone know what is the ownership of the lands making up the landscape shown in the pictures? Private? Federal? State? Thanks for leading the Mutiny charge again, Gabe! This is such a great route, approachable to a wide range of cyclists and she to be lovely nearly year round. Highly recommend renting a fat bike from the Mountain Shop – super wide tires will make the relativity rocky trail feel more comfortable. 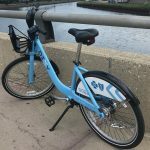 Is there a good reason to not have fenders on a ride like this? 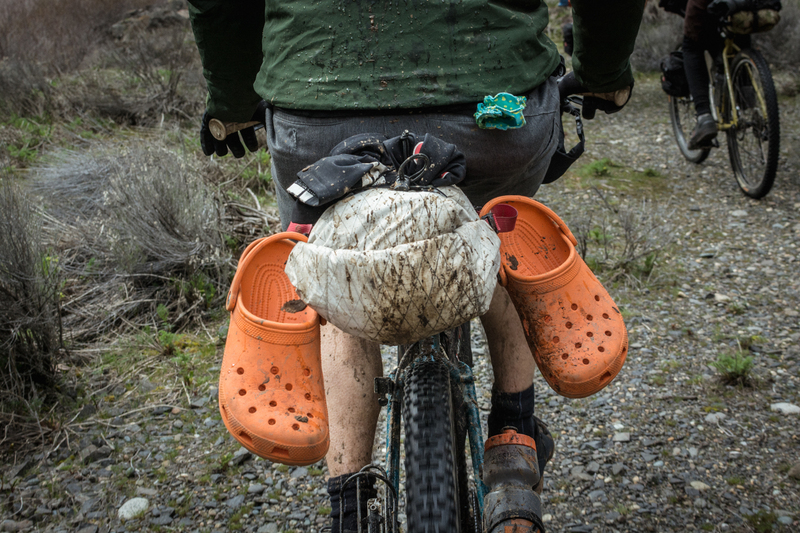 I’m not a mountain biker, so please enlighten me. Sticks and rocks can get kicked up and destroy fenders pretty easy, they tend to be rather fragile. Mud build up can be a problem too. What about those half fenders that just stick onto your seatpost? Looks like they won’t have any those problems and will still keep your backside dry. Probably because you’re going to get wet anyway, why try to stop the inevitable? No, you’re right, I was wishing I had a set of PDW’s Mud Shovel fenders! I have ridden this route on a cyclecross bike with full fenders. It was fine. A happy crotch is a good thing. Martha Stewart approved this. 32c tires were just enough for the trestles. I didn’t know that there is any legal camping along the Klickitat Trail. In fact, I doubt there is. I’ve ridden it and hiked it numerous times and I recall that the linear park is only open for daytime use. Camping is allowed at the Mineral Springs campsite just NE of Klickitat. I think there is at least one other legal campsite closer to Lyle where boating access is also provided. I remember the orange crocs guy. I guess we crossed paths.